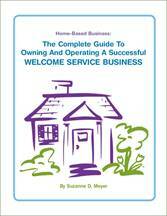 What is a Welcome Service Business (WSB)? A Welcome Service Business (WSB) is a personal advertising service targeting a specific niche, the new homeowner. It is a personal greeting service for new homeowners. The purpose of the welcome visit is to provide newcomers with helpful community information that will transition them quickly to their new environment. It is an advertising service for local businesses. The Welcome Representatives extend the warm welcome on behalf of the business community. The goal of the Welcome Representatives is to influence the newcomer's buying decisions, helping to establish long-term relationships between the consumer and the merchant. What Value does a WSB provide? The value proposition that your business offers to the new homeowner / business is similar to that of a "Community Ambassador." As an established resident, you are a trustworthy and reliable source for advice and referrals regarding your community. The value proposition that you offer to businesses and professionals is that of an "outsourced" sales and marketing force. You are their personal marketing connection for promoting their goods and services to the newcomers. Revenue for the WSB is earned via monthly billings paid by participating businesses and professionals. How to start a WSB? The information outlined in the WSB manual is a compilation of my 23 years in the WSB industry and 34 cumulative years in the advertising, marketing and public relations arena. This information will save you thousands of dollars in legal fees, research, advertising, marketing and public relations start-up expenditures necessary to launch this type of business successfully. you will be generating immediate income.